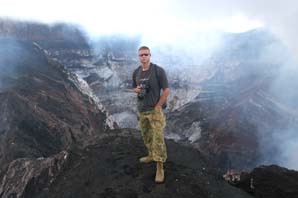 The latest expedition was to the volcanoes of Marum and Benbow on Ambrym Island in Vanuatu, with me were camerawoman Rachael Wilson, mountaineer and rigger Mark Whetu and assistant Daniel Lewis. 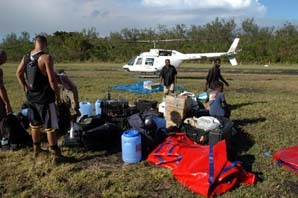 The expedition was cut short by a tropical storm which trashed our camp and damaged our equipment. 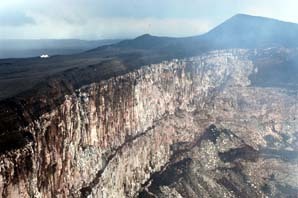 This trip will make up one episode of my Discovery Channel TV series, "Dangerman" The volcanoes on Ambrym Island are among the most remote and inaccessible volcanoes on earth, there are no roads and the area is frequently hit by heavy rain, cyclones and earthquakes. 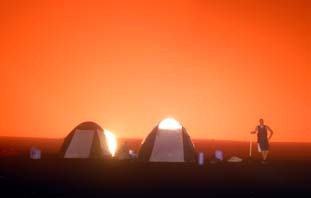 Below are the daily updates as I posted them during our time at Ambrym. 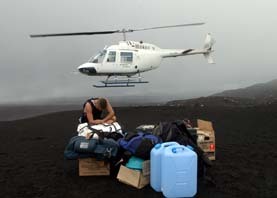 After 2 days of frustrating weather delays and a failed attempt to land the helicopter on the summit of Marum Volcano two days ago we made it in with 4 helicopter loads comprising of 700kg of rigging gear for the descent into the crater, initial observations show 2 violently boiling lava lakes at the bottom of a 200m pit. 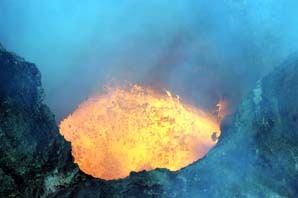 The last two days have been spent preparing for a descent into the lava lake pit and struggling to keep our tents from being flattened by high winds, and heavy rain, not to mention being gassed by fumes, we have been afforded a few glimpses into the pit and the lava lakes are a truly amazing sight. We scramble from what is left of our camp after 2 days of constant high winds and rain finally wreck both our tents at daybreak, after 12 hrs of carrying all 700kg of equipment to a new, more sheltered campsite down from the summit area we finally finish makeshift repairs to the tents and put them back up at nightfall amid clouds of choking fumes and heavy rain that tasted like battery acid....does this sound like fun ? Bigger mess, different location...shortly after we moved our broken tents and equipment down the hill and repaired them they were again flattened by the wind, we then had to spend the next 48 hrs huddled under what was left waiting for a helicopter to get in and rescue us, soaking wet, freezing cold and eyes stinging from the high strength acid rain that severely corroded every exposed metal surface in only a few hours....oh, and then the generator overturned in our tent adding petrol to the water we were lying in. 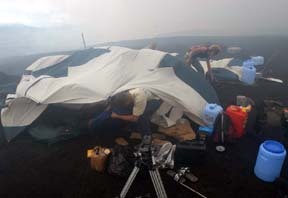 Winds from the slow moving 997hpa tropical low exceeded 100kph and pounded us with torrential rain almost constantly for 4 days during which time we were awake the whole time just trying to hold up the tents...to make matters worse the winds were driving toxic choking fumes directly onto us from Marum's crater....then, the cave we were trying to dig into a cliff in desperation to create shelter collapsed, nearly burying Rachel and Mark. At about this time as we resigned ourselves to another night of hell, pilot Phil Cotter from Port Vila finally managed to land after repeated attempts plucking us to safety in almost zero visibility and high winds. 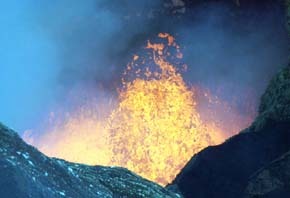 We left with only the clothes we were wearing and a few pieces of camera equipment, the rest being destroyed or blown away. 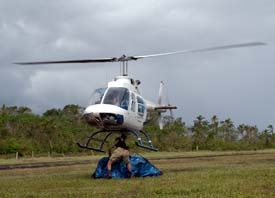 RESCUED ....by helicopter at 3pm local time 22 March taking with us only what gear we could carry, our tents and most of our equipment destroyed by a tropical storm.....all well. 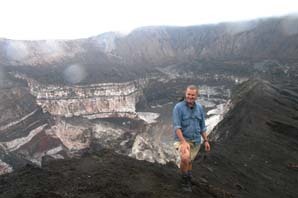 On the afternoon of 26 March I returned to Ambrym with pilot Phil Cotter and managed to successfully retreive all of our equipment. About 70% of it had survived the storm undamaged inside Pelican cases. 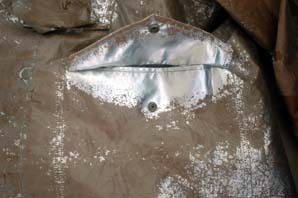 The rest of it was ruined or damaged by the battery acid strength rain that fell on us.